“Butterfly Town USA” has seaside enchantments, too. 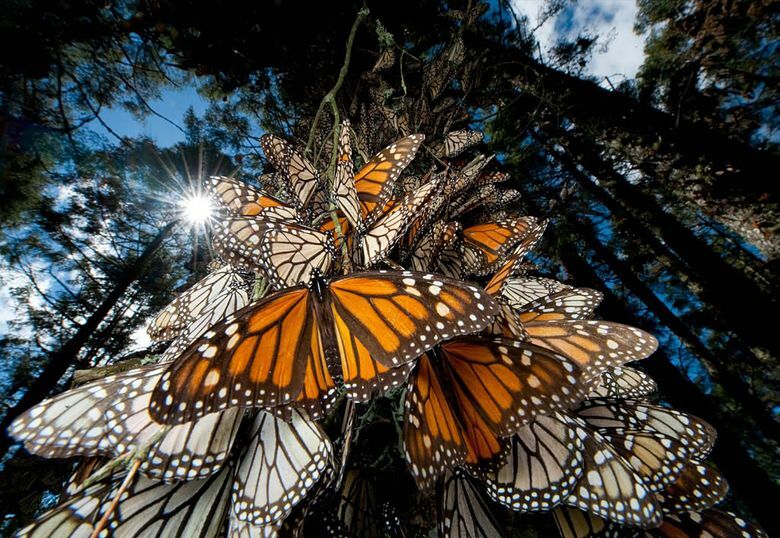 Monarch butterflies cling to a tree branch in the monarch refuge in Pacific Grove, where the butterflies overwinter by the thousands. PACIFIC GROVE, Calif. — I wouldn’t dare say butterflies aren’t reason enough. But, psst, there are other reasons to visit Pacific Grove. 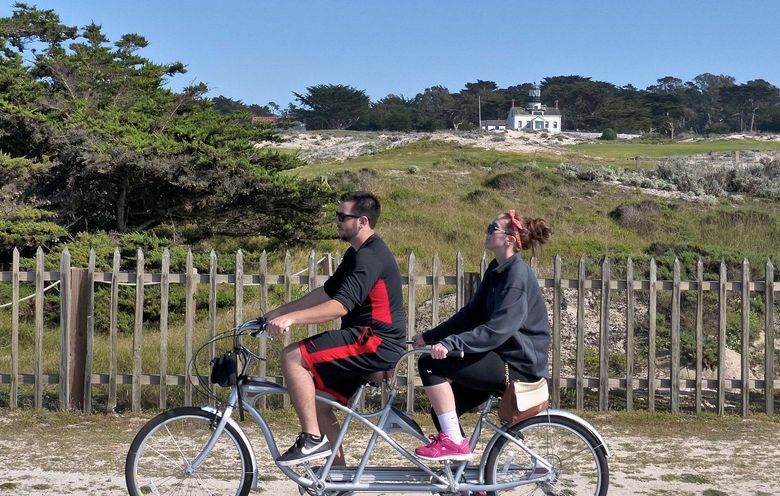 If you’re heading for Monterey to see the aquarium or the jazz festival, or making day trips to Point Lobos or Big Sur, Pacific Grove is the place to stay. It’s home to an enchanting little dune-edged municipal golf course with its own lighthouse. With sculpted granite rocks framing crashing azure waves, it has some of the best oceanfront scenery within an incorporated city in the United States. It is full of Victorian inns, some of the world’s most scenic cypress trees, and — yes, at this time of year — monarch butterflies. More butterflies than people, at times. 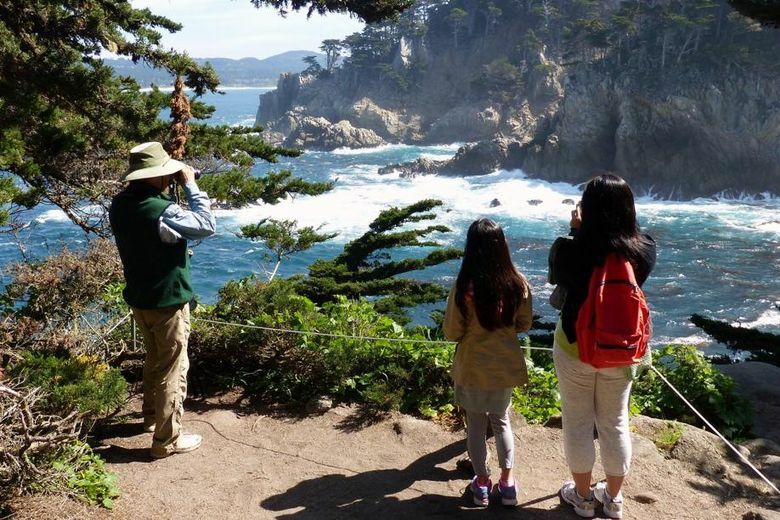 Point Lobos has some of Earth's prettiest coastline. See the aquarium, kayak the bay in Monterey. A grove of pines and eucalyptus edging downtown has for years attracted overwintering monarchs by the thousands, earning Pacific Grove, with a human population of 15,600, the nickname “Butterfly Town U.S.A.” It is one of the largest monarch-overwintering sites in America, with last year’s peak count of 24,123 coming on Nov. 16, 2014. November to February are the prime months for seeing them. The butterfly sanctuary is a city park, open to all at no charge, and it is wheelchair-accessible. Docents are on hand daily from noon to 3 p.m., weather permitting, to help you spot butterflies. But as I said, there’s more — like one of the planet’s best scenic waterfronts for walking or biking. 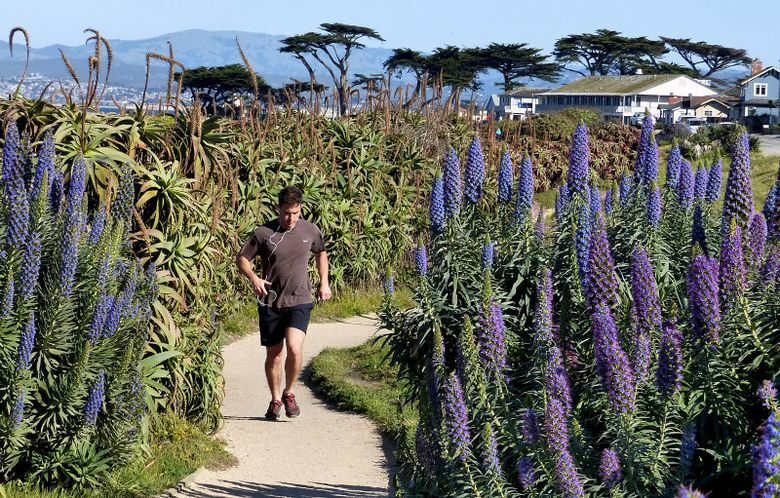 An “official” recreation trail leads from Lovers Point to the Monterey Bay Aquarium and beyond, but continue westward from Lovers Point, following aptly named Ocean View Boulevard, on a more informal path (bikes can follow the road). There’s miles more fabulous scenery dotted with giant blue lupine-like flowers, called Pride of Madeira, and neon-flowered ice plant (a very pretty invasive), including the protected areas of Pacific Grove Marine Gardens and Asilomar State Beach, all part of Monterey Bay National Marine Sanctuary (montereybay.noaa.gov). Just across from the marine gardens the city-run 18-hole Pacific Grove Golf Links (playpacificgrove.com) offers similar scenery to nearby Pebble Beach golf course, at a fraction of the cost for a tee time. In 2006, the Coast Guard officially deeded the Point Pinos Lighthouse, whose reservation included the golf course’s back nine, to the city under the Excess Military Property Initiative. Guiding mariners since 1855, Point Pinos is said to be the oldest existing lighthouse on the West Coast, and still operating. It’s open to visitors from 1-4 p.m. daily except Tuesdays and Wednesdays ($1-$2; pointpinoslighthouse.org). Pacific Grove’s downtown is out of sight of the water, but has its own special atmosphere. Giant eucalyptus trees spice the air. Founded in the 1870s as a Methodist summer retreat, the town core is a maze of small blocks. Here, rough army tents once occupied 30-foot-by-60-foot lots. Some of the small cottages remaining today were framed right over the original tents, using the canvas as insulation. Pick up a self-guided walking-tour map at the tourist-information center (584 Central Ave.) and happily wander the crowded blocks to see an eclectic sampling of historic home styles, from grand Queen Anne gables and turrets to tiny kit houses from Sears, Roebuck & Co.
Little plaques on many of the homes bear the name of the original owner and the date they were built. To qualify for a plaque from the Heritage Society of Pacific Grove, the home must look as it did when first constructed. 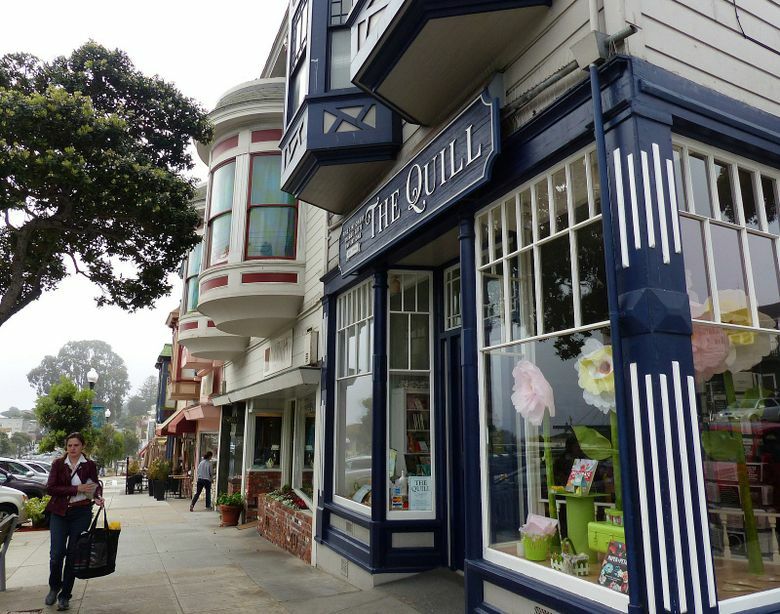 The business district has a Victorian look, with bay-windowed storefronts and shops such as The Quill, which sells stationery (a world still exists beyond texting! ), alongside cozy eateries like Red House Café, a converted 1895 cottage where a table next to the fireplace felt good on a foggy March morning. A “Breakfast Trifle” (house-made granola layered with yogurt, honey and fresh berries, in a parfait glass; $7.95) was complemented by the largest, most indulgent cup of hot chocolate I have ever encountered. Another happy find: the Sunset Specials, available if seated between 4 and 5:30 p.m., at the Beach House Restaurant on postcard-perfect Lovers Point. With full-size entrees priced at $9.90 (such as panko-crusted sand dabs or a cider-cured pork chop), a Firecracker shrimp appetizer for $5 and soup or salad for $3.90, you get a good three-course dinner for under $20 — a screaming deal in coastal California. Views can’t be beat (beachhousepg.com). On a tourist-saturated, 70-degree spring-break day, I marveled to my server at the number of swimmers wading into the bay from the sandy pocket beach framed by pines and cypress outside my window. Is that normal in March? I asked her. “Yes, it’s normal, but I think it’s people who are not from California!” she said with a shiver and a smile. Go now for the butterflies, in spring for the sun (and frolicking tourists from Iowa), or next October for the annual Butterfly Parade. Or go any time and just enjoy one of California’s classier little seaside towns. Good places to stay in Pacific Grove range from landmark Victorian B&Bs such as Gosby House (gosbyhouseinn.com ) and Green Gables (greengablesinnpg.com ), to the simple Borg’s Ocean Front Motel (across the street from the water, where Seattle Times jazz critic Paul de Barros stays when he goes for the jazz fest; borgsoceanfrontmotel.com ). I liked the affordable and cozy Sunset Inn, with its feel of a 1940s motor lodge, tucked in a neighborhood near the golf course (gosunsetinn.com ). For more on butterfly viewing, and reports on how many are in town, see the Pacific Grove Museum of Natural History website, pgmuseum.org/monarch-viewing , and visit the museum at 165 Forest Ave.; $5.95-$8.95.